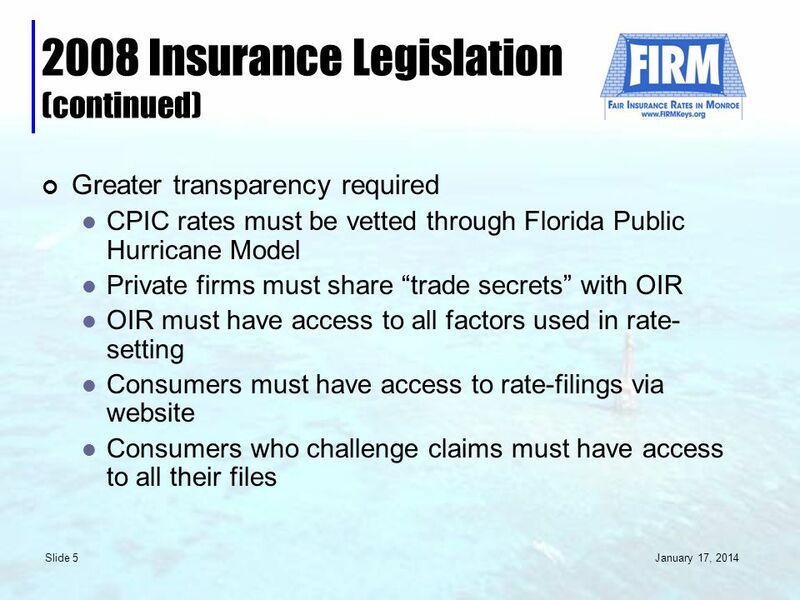 Hurricane Preparedness Summit An Update Prepared by the Grassroots Organization FIRM Fair Insurance Rates in Monroe June 2, 2008. 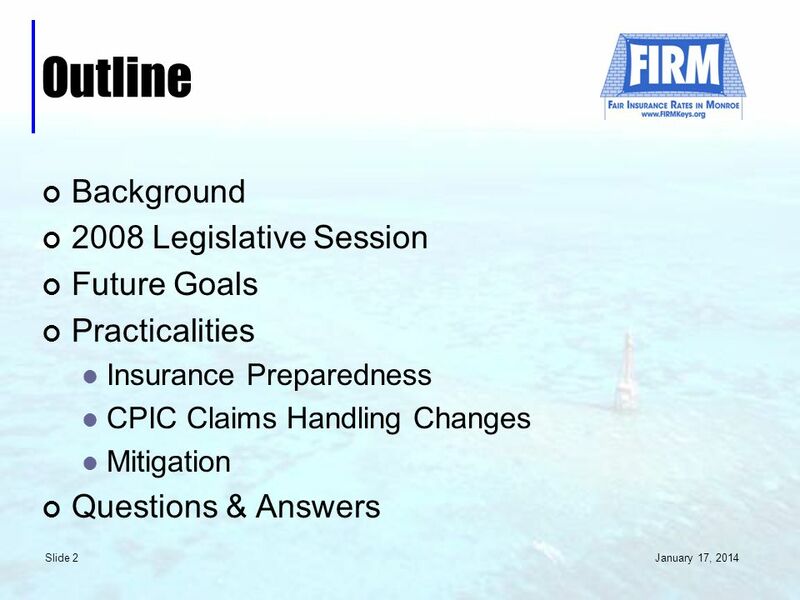 3 January 17, 2014 Slide 3 Background – Whats FIRM? 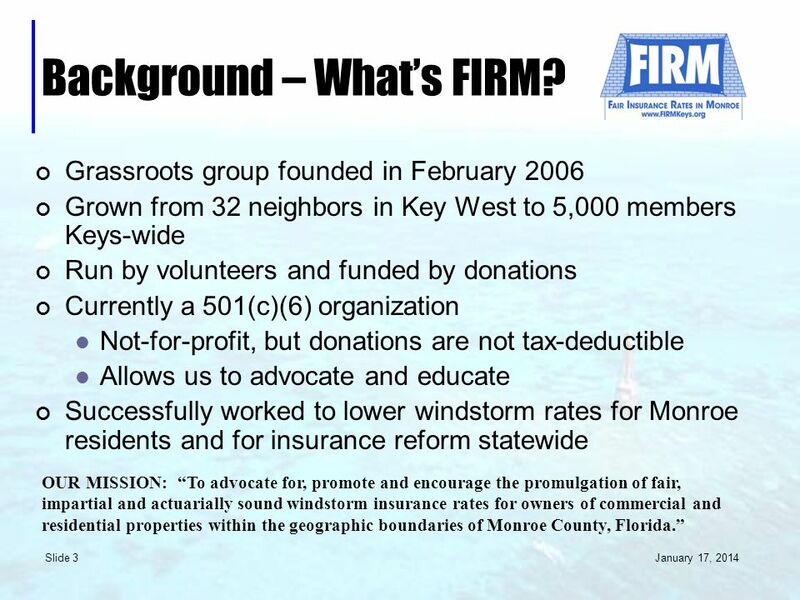 Grassroots group founded in February 2006 Grown from 32 neighbors in Key West to 5,000 members Keys-wide Run by volunteers and funded by donations Currently a 501(c)(6) organization Not-for-profit, but donations are not tax-deductible Allows us to advocate and educate Successfully worked to lower windstorm rates for Monroe residents and for insurance reform statewide OUR MISSION: To advocate for, promote and encourage the promulgation of fair, impartial and actuarially sound windstorm insurance rates for owners of commercial and residential properties within the geographic boundaries of Monroe County, Florida. 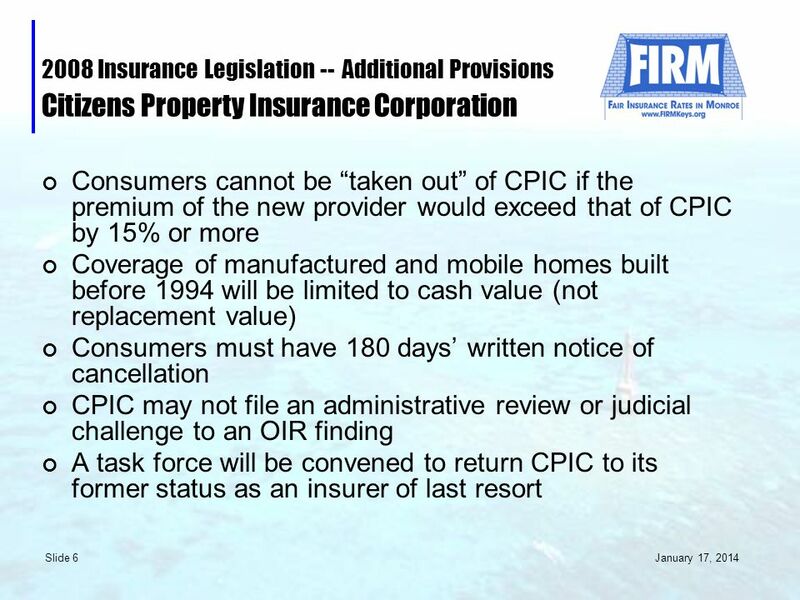 7 January 17, 2014 Slide 7 2008 Insurance Legislation -- Additional Provisions Citizens Property Insurance Corporation (continued) As of January 1, 2009, any home with an insured value of $750,000 or more must have shutters to be insured by CPIC. 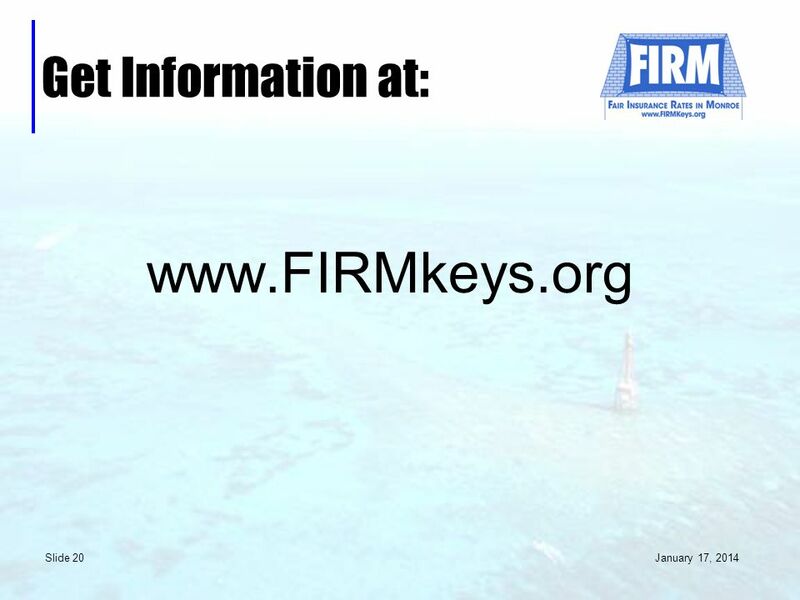 As of January 1, 2011, any buyer of a residential property (regardless of insured value) located in the windborne debris region must receive a written disclosure of the structures windstorm mitigation rating from the seller. 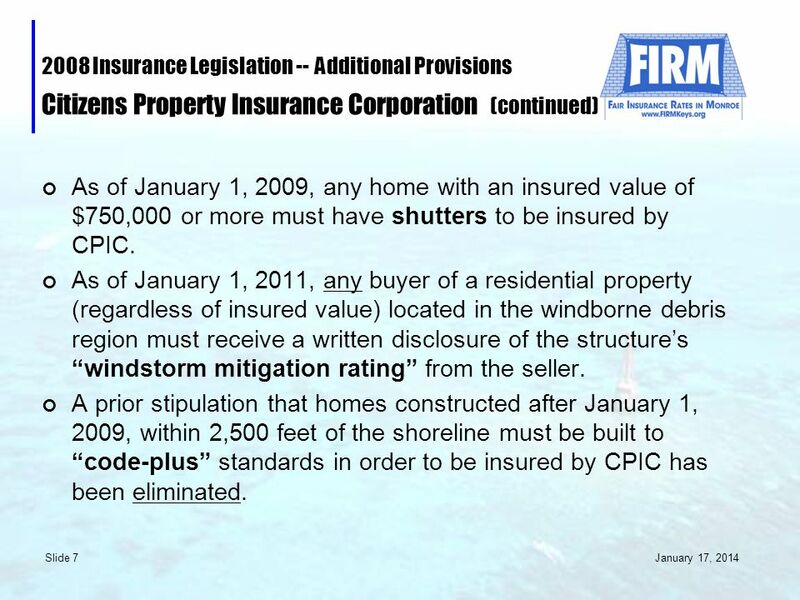 A prior stipulation that homes constructed after January 1, 2009, within 2,500 feet of the shoreline must be built to code-plus standards in order to be insured by CPIC has been eliminated. 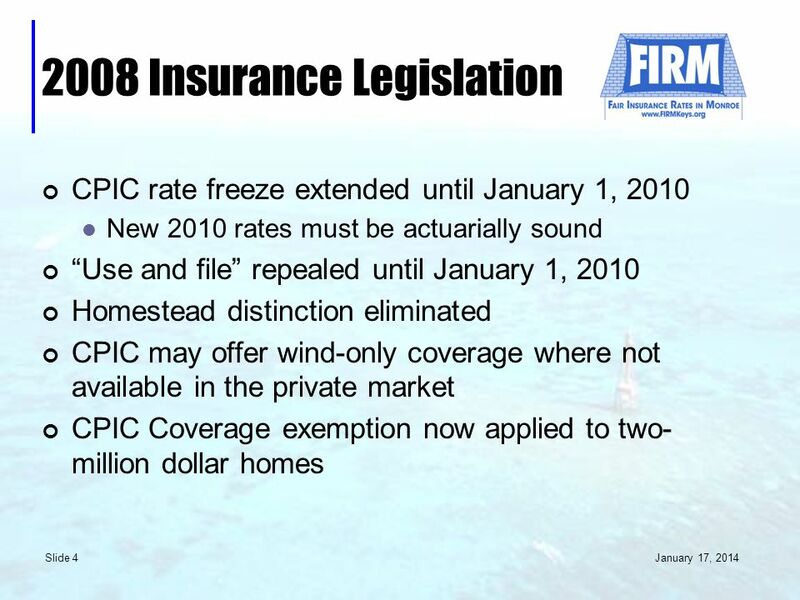 8 January 17, 2014 Slide 8 2008 Insurance Legislation -- Additional Provisions Citizens Property Insurance Corporation (continued) Assessments to cover existing CPIC deficits will now kick in when CPIC deficits exceed 6% of their projected direct written premium for that year. Emergency assessments may be required when/if regular assessments are insufficient to recover the existing deficit, and may be levied for as many years as necessary to eliminate the deficit. Such emergency assessments may not exceed 10% of the amount required to eliminate the deficit or 10% of the statewide premium, whichever is greater. 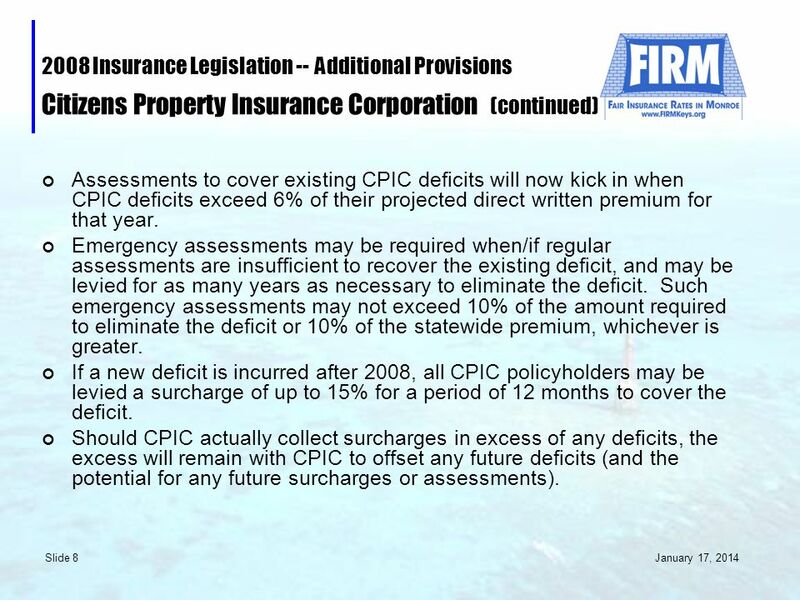 If a new deficit is incurred after 2008, all CPIC policyholders may be levied a surcharge of up to 15% for a period of 12 months to cover the deficit. Should CPIC actually collect surcharges in excess of any deficits, the excess will remain with CPIC to offset any future deficits (and the potential for any future surcharges or assessments). 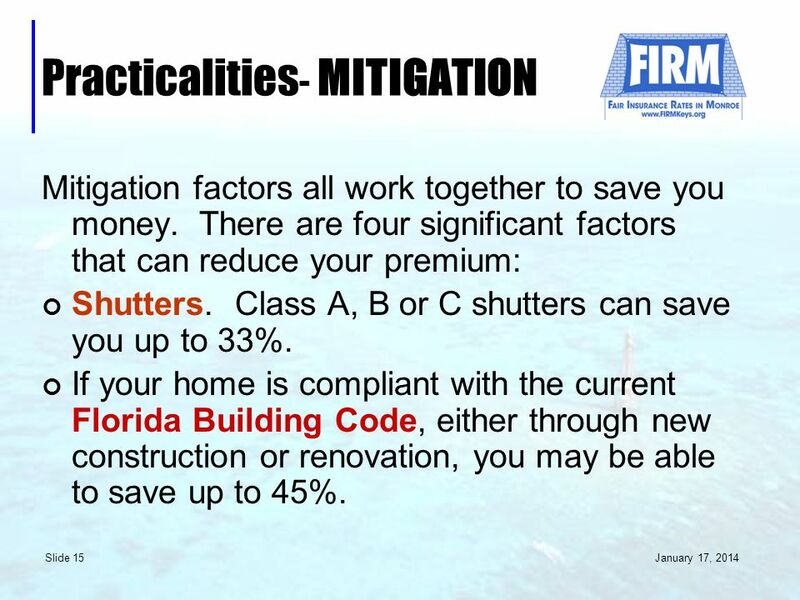 15 January 17, 2014 Slide 15 Practicalities - MITIGATION Mitigation factors all work together to save you money. There are four significant factors that can reduce your premium: Shutters. Class A, B or C shutters can save you up to 33%. 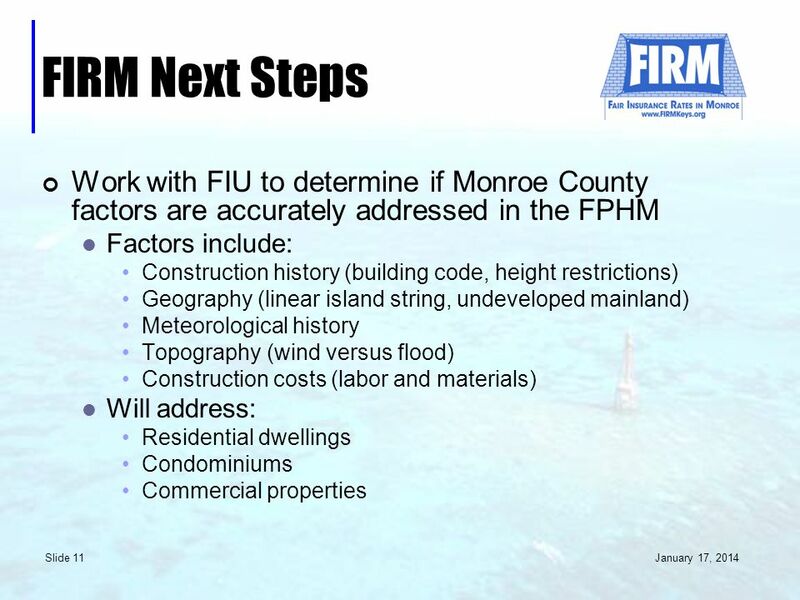 If your home is compliant with the current Florida Building Code, either through new construction or renovation, you may be able to save up to 45%. 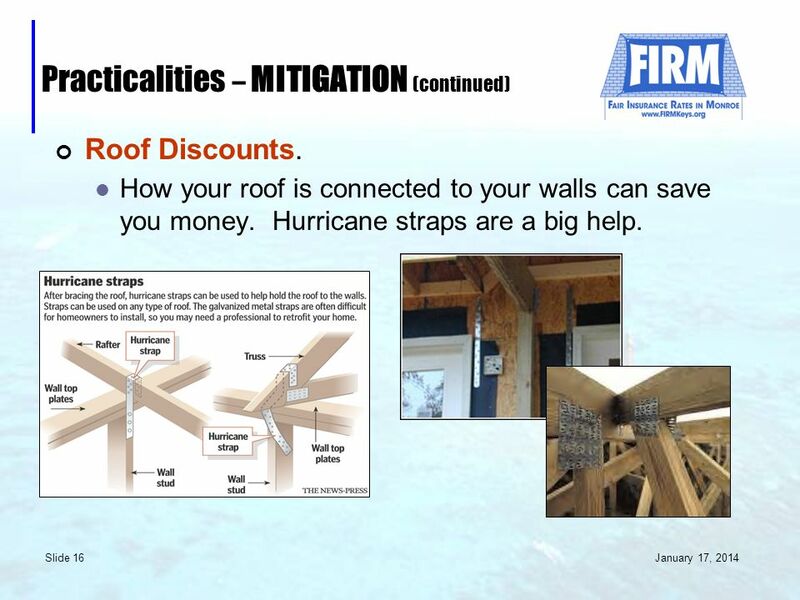 16 January 17, 2014 Slide 16 Practicalities – MITIGATION (continued) Roof Discounts. How your roof is connected to your walls can save you money. Hurricane straps are a big help. 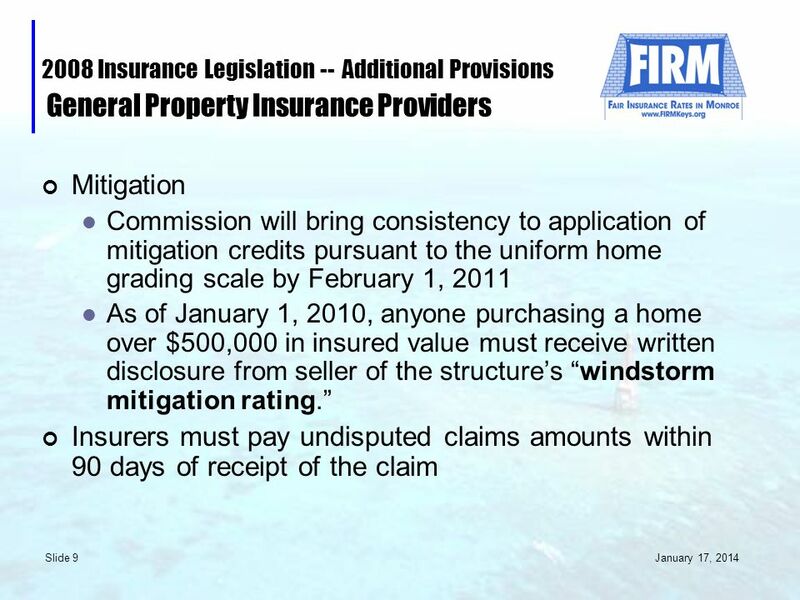 17 January 17, 2014 Slide 17 Practicalities – MITIGATION (continued) Roof Discounts. How your roof is covered can also save you money. A small mitigation credit is available for metal roofs. 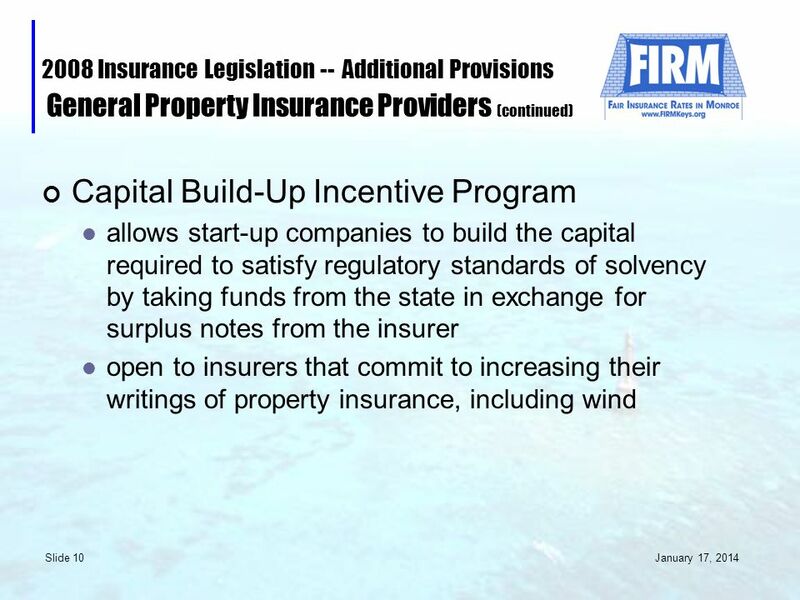 However, there is no pre-designated space on insurance applications to account for these discounts. Ask your agent to make a special note if you have a sheet metal roof to qualify for a discount. 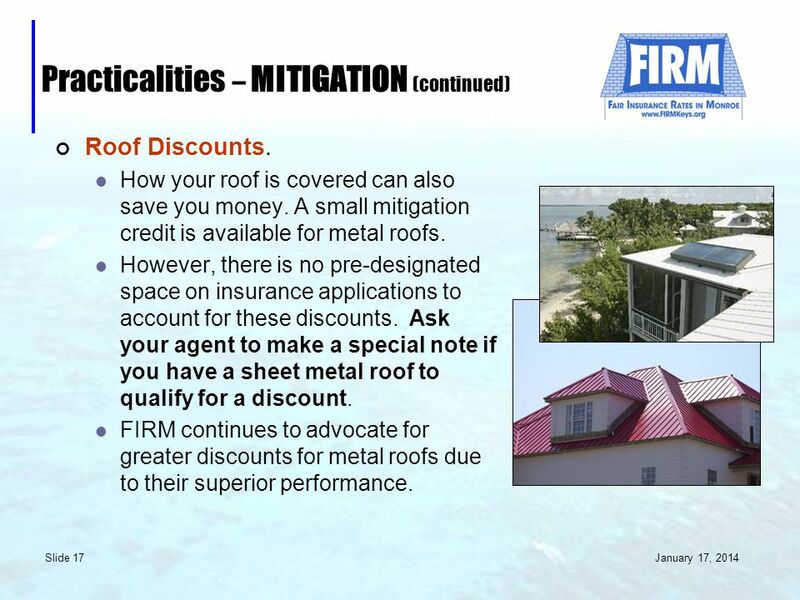 FIRM continues to advocate for greater discounts for metal roofs due to their superior performance. 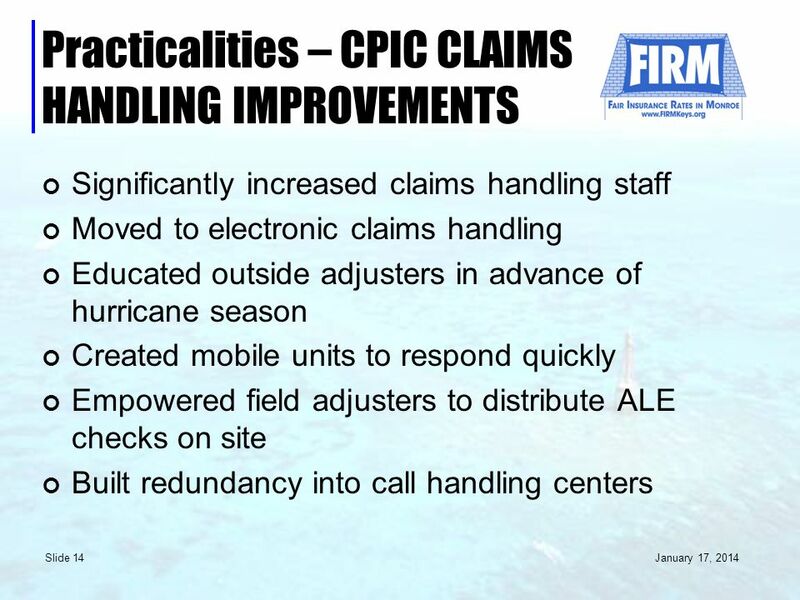 18 January 17, 2014 Slide 18 Practicalities – MITIGATION (continued) Construction. 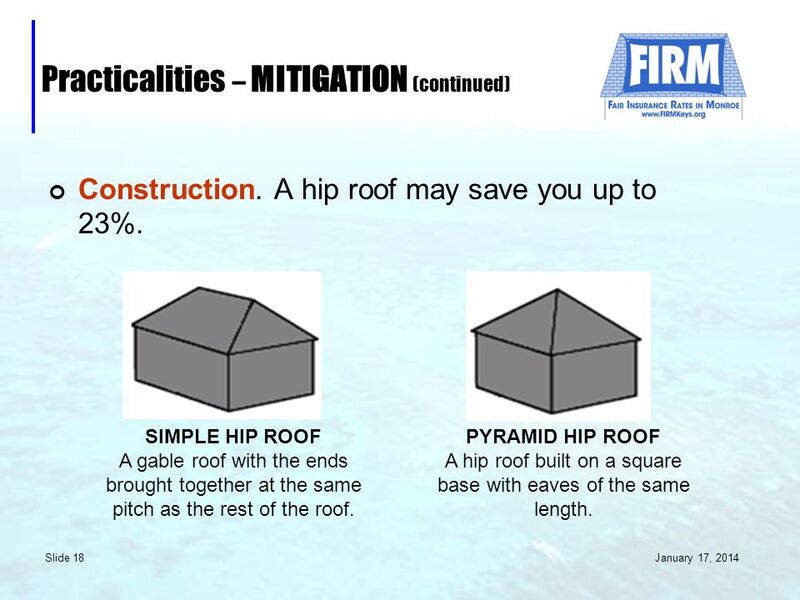 A hip roof may save you up to 23%. SIMPLE HIP ROOF A gable roof with the ends brought together at the same pitch as the rest of the roof. PYRAMID HIP ROOF A hip roof built on a square base with eaves of the same length. 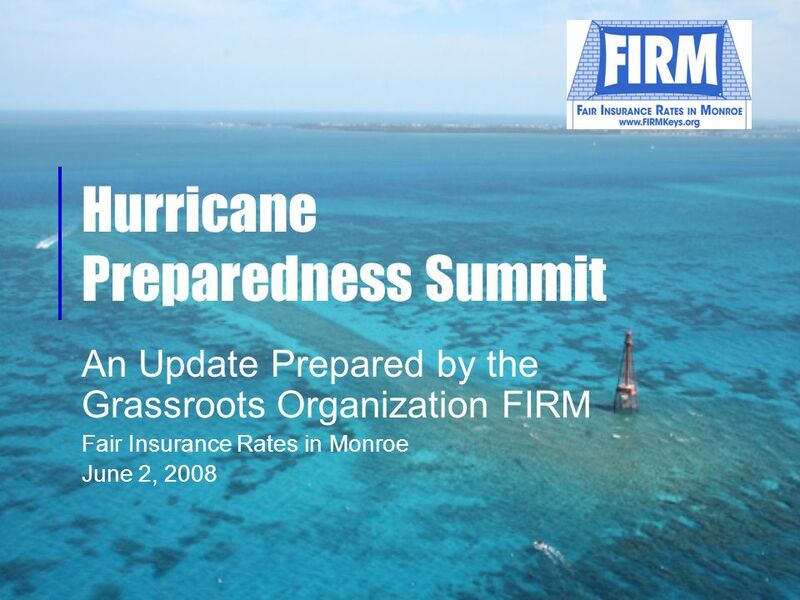 Download ppt "Hurricane Preparedness Summit An Update Prepared by the Grassroots Organization FIRM Fair Insurance Rates in Monroe June 2, 2008." 1 Actuarial Management Resources, Inc SEAC Spring Meeting Miami Beach, Florida Individual Health Topics Exploring Methods for Premium Deficiency. This is an audio-enhanced PowerPoint presentation. To hear the audio, please open this presentation in Slide Show view. 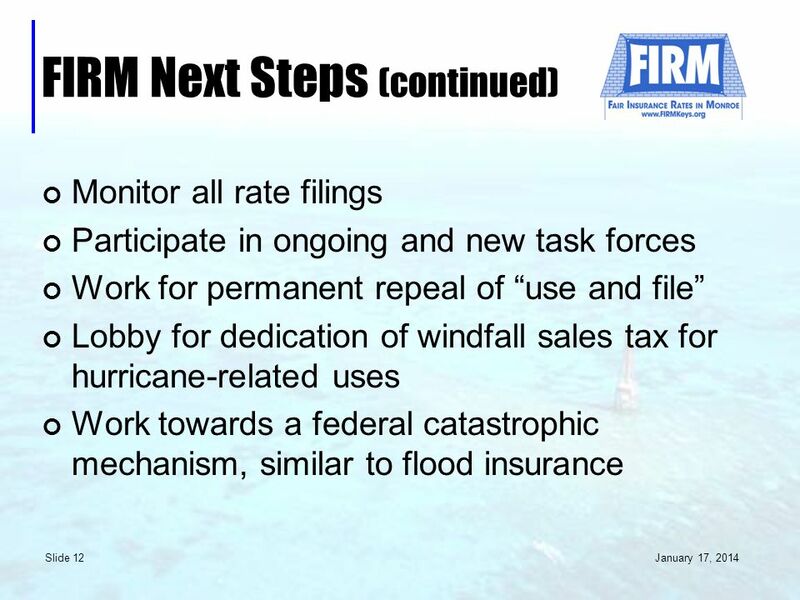 Changes to the National Flood. 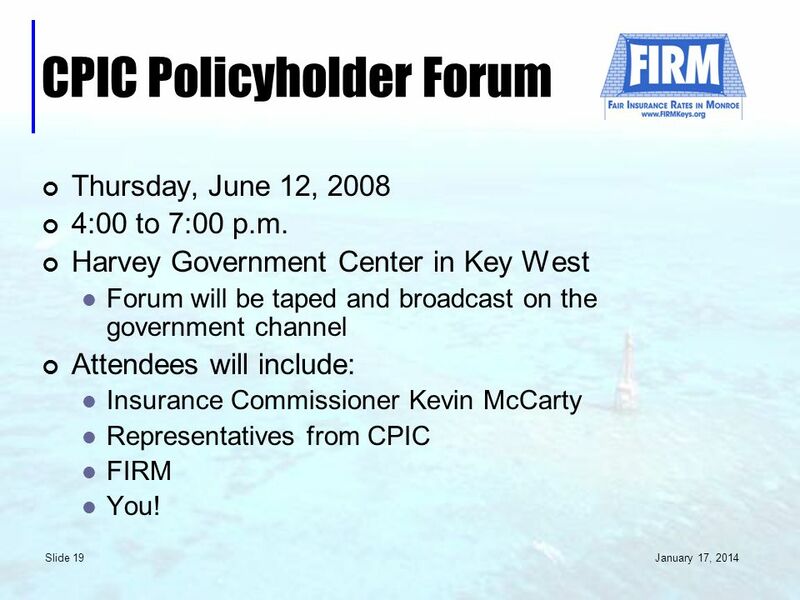 Copyright © 2006 by The McGraw-Hill Companies, Inc. All rights reserved. McGraw-Hill/Irwin 14-1 Chapter Fourteen Auditing Financing Process: Prepaid Expenses. CATASTROPHE INSURANCE Insurance 101 The Myth: RISK PURE RISK - chance of a loss – usually computed in $$$. SPECULATIVE RISK – chance of a loss or gain. Agent Breakout What You and Your Clients Need to Know about Rising Risks, Rising Rates, and Their Effects on Rebuilding Decisions. This is an audio-enhanced PowerPoint presentation. To hear the audio, please open this presentation in Slide Show view. 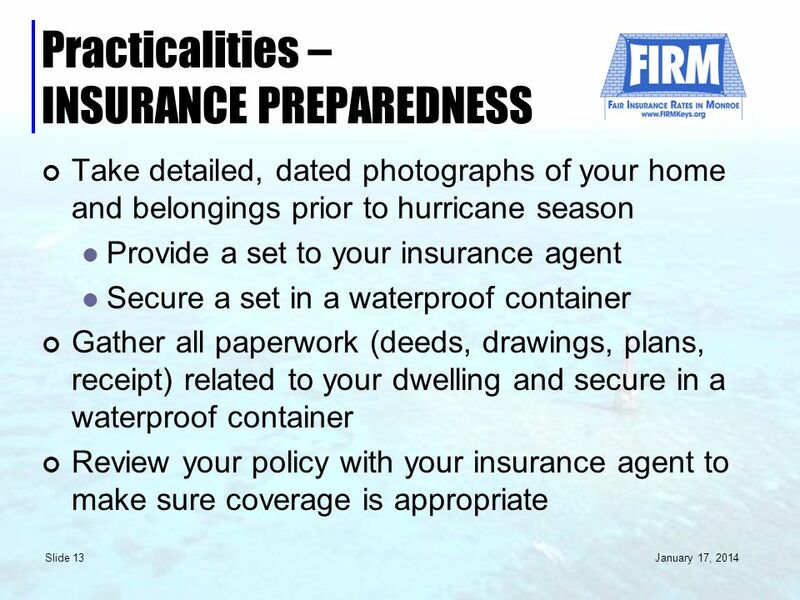 Biggert-Waters Flood Insurance. 1 CAS Ratemaking Seminar New Orleans, LA State – Specific Issues in Personal Lines March 11, 2005.